This lot was originally just an experiment of mine that wasn't going to be anything more than neighborhood decoration once it was finished. As I was working on it though, I started to see more and more interesting potential in it, and I was happy enough with the results (especially after realizing what fantastic cardboard boxes the IKEA MALM tables and dressers make) that I decided to round out the details and share it with the rest of the community. 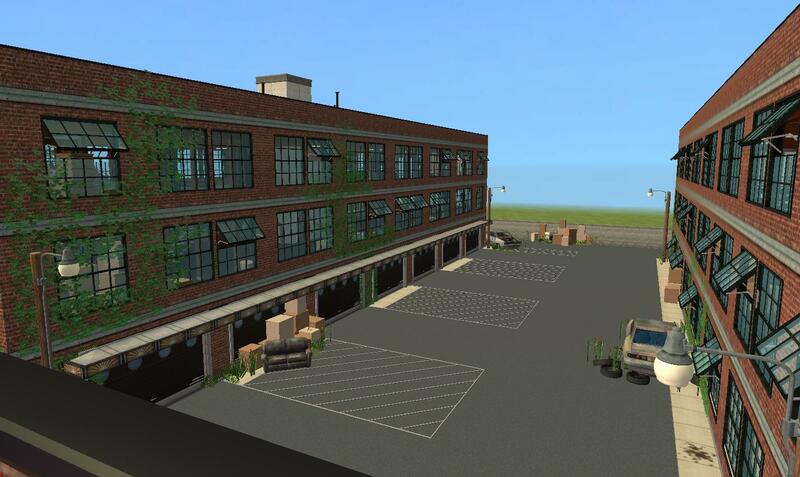 There are already a number of warehouse or industrial themed lots that other creators have shared with the community, but in looking at them, I was struck by one thing above all- they were all "refurbished." 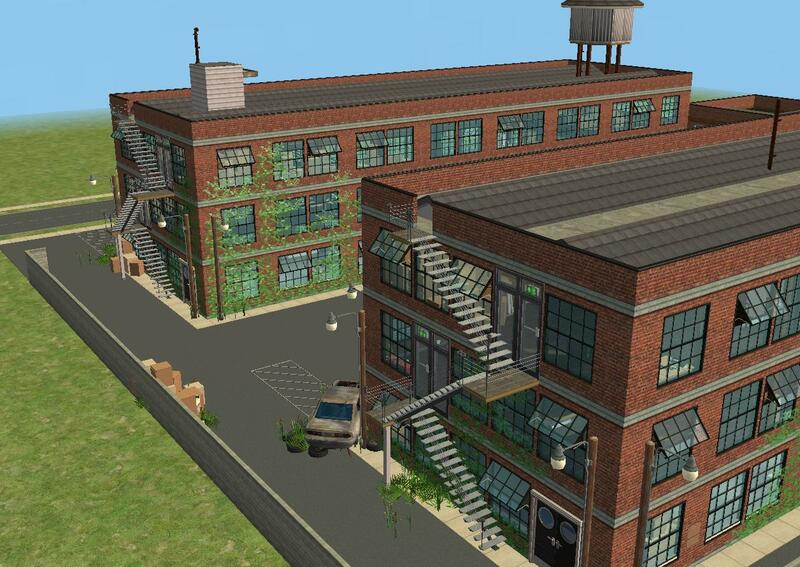 Not one of those lots actually carried the abandoned industrial vibe over to the inside, at least not on the same scale that it was on the exterior. Well, I couldn't have that now, could I? 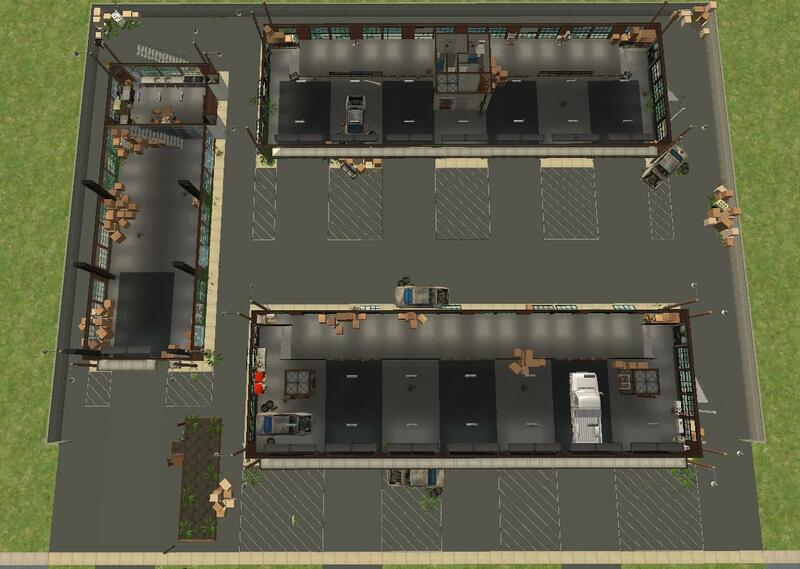 You're certainly welcome to repurpose these warehouses into chic lofts or whatever you like, but I wanted to make something that was consistent in being run-down and abandoned both inside and out, and while I leave it for you to be the final judge of that, I'd like to think I've succeeded. One of the things that I find most challenging in my adamant "No CC ever" philosophy is finding ways to make lots look lived-in, abandoned, derelict, or really anything other than brand-new. While this is fine when it comes to the glittering highrise apartments and skyscrapers that adorn the center of my Downtown (and the Downtowns of plenty of you too now, I hope! ), it makes it difficult to properly depict the more run-down sections of a city- the trailer parks, the ghettos, and the rows and rows of abandoned warehouses and factories that seem to line the railyards and docks of cities all across the globe. 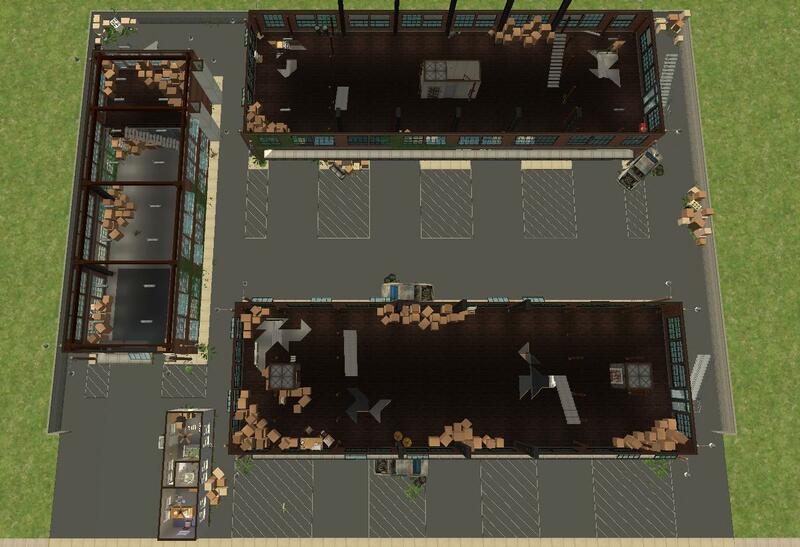 Thus, the Armscor Warehouses were born. 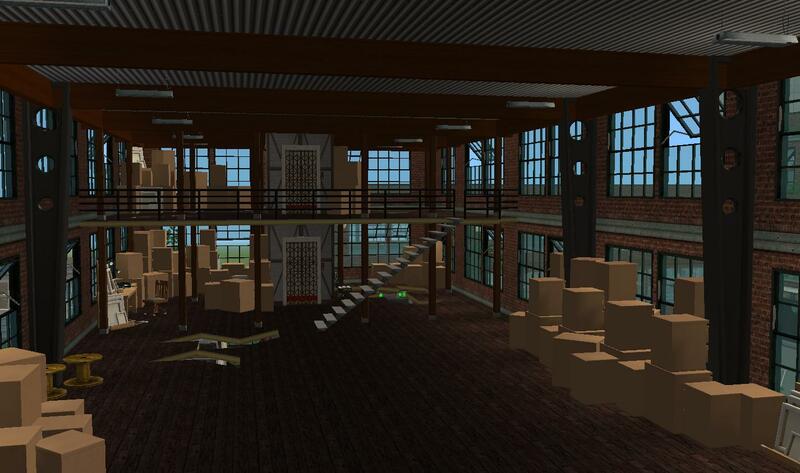 I wanted to find something where I could try out different approaches to making things look shabby and abandoned, and what better place to begin than with an abandoned block of shipping and receiving warehouses? While there's all sorts of things that could be going on in such a location, I decided this lot wouldn't have any hidden surprises or unexpected bonuses- I leave that to you! As is, this lot is nothing more than a left-behind company lot, shut down decades ago, by the look of things. 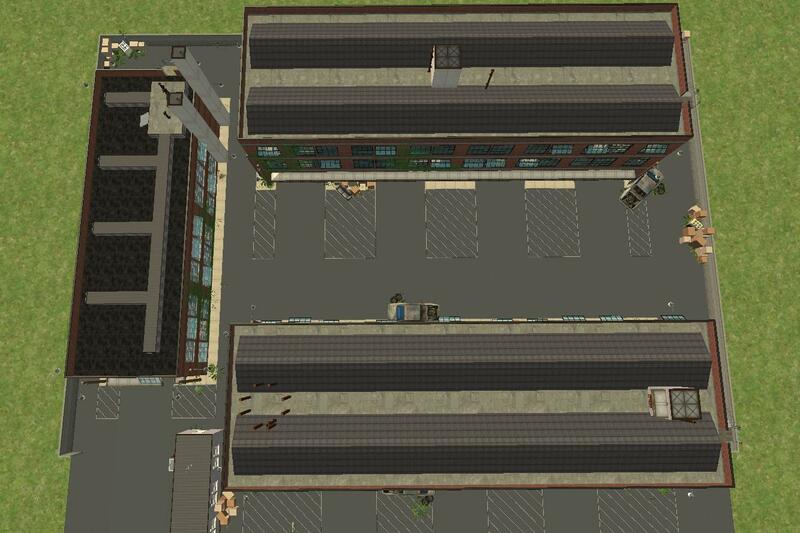 Obviously this lot would have been a commercial site when it was first constructed, but I couldn't find any way of making it at all worth visiting for Sims today, so I opted to create it as a residential area instead. 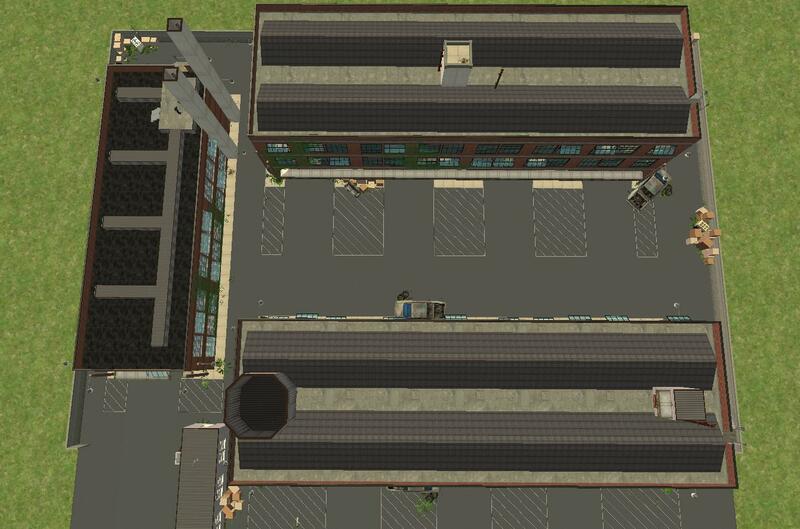 Whether you choose to use it to house homeless Sims (who just happen to have $400,000), to run a back-alley criminal empire, or to provide temporary shelter for Sims struggling to survive in a post-apocalyptic nuclear wasteland, there are plenty of opportunities to be found. The one thing you won't find is anything resembling a normal house or lifestyle. 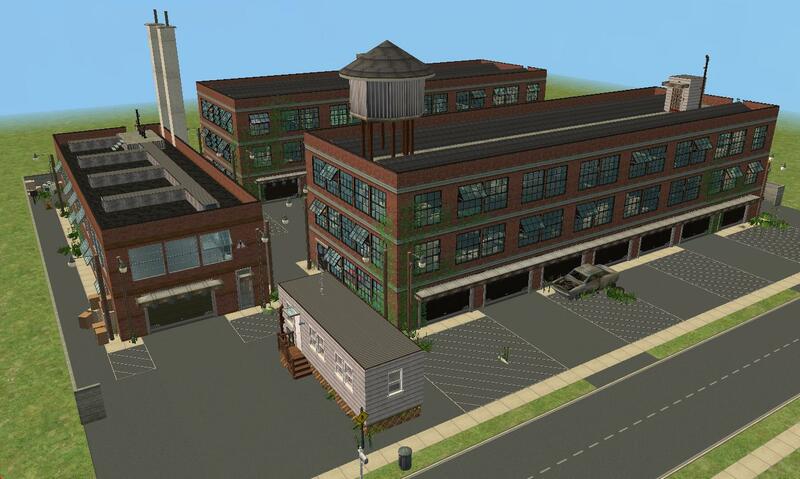 That isn't to say that you won't be able to live off what's provided here- I've made sure that any of your Sims' needs will be able to be met somewhere in these warehouses. 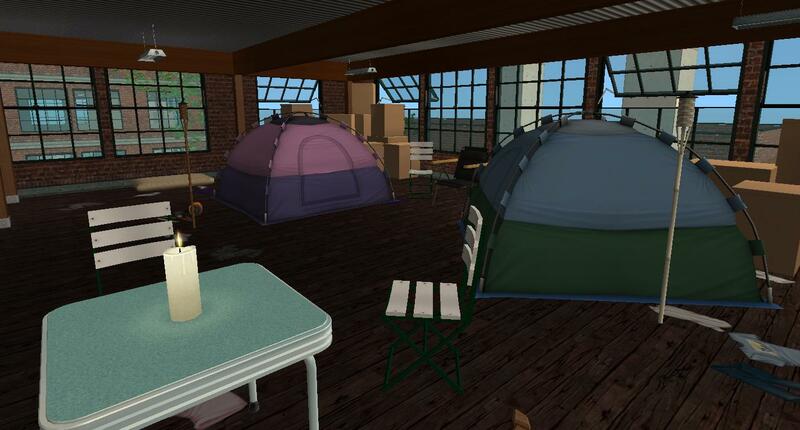 There are chairs scattered about, where you can rest for a spell, there's a grill and re-purposed boiler room (with a salvaged refrigerator) in the back of the smaller warehouse, there's employee bathrooms and showers in the core of the back warehouse, and for Sims who feel safe enough to shut their eyes for a spell, there's a couple tents set up in a small campsite on the upper level of one of the warehouses. 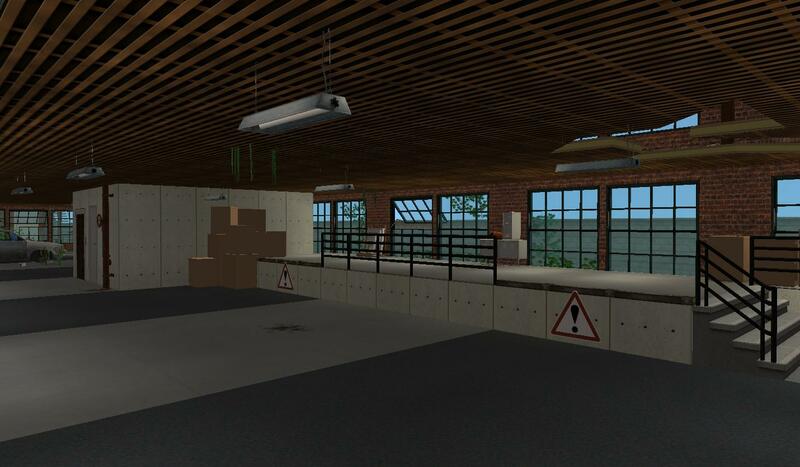 Fun will be the hardest need to fulfill, but even that should be possible- there's a few employee TVs (assuming you're playing as though electrical items here are still functioning), and bookcase in the foreman's office in the trailer. Not much, but hey, if you're living here, chances are fun isn't the highest item on your priority list! This lot made judicious use of the 45-degree placement cheat, quarter tile placement, and of course, move_objects, so there are plenty of items that (obviously) aren't able to be interacted with properly. 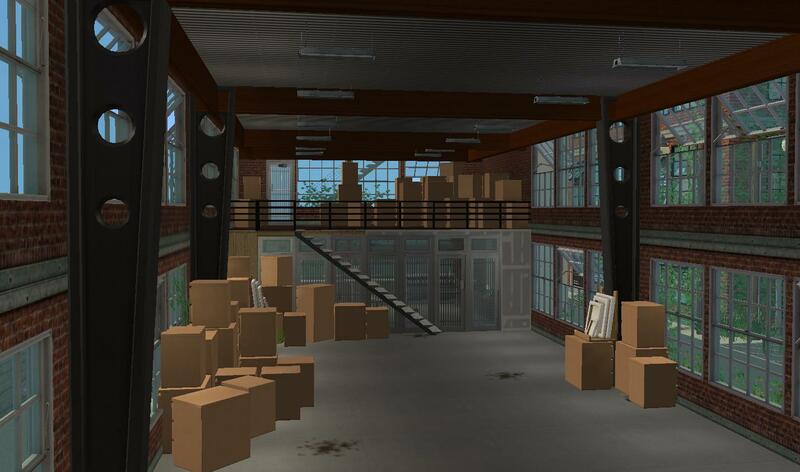 The biggest example is the piles of MALM furniture that, at least to me, look just like cardboard boxes or shipping crates when placed correctly, but there are a good many other examples throughout the huge empty spaces of the warehouses. Most of these should be obvious, so I trust that you can figure them out on your own for the most part, but there's a few that bear mentioning. 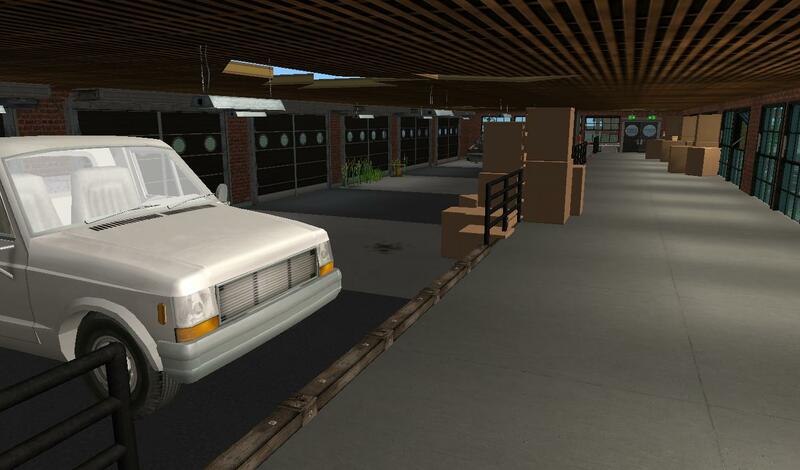 So far as I can tell, the pickup truck is driveable without any trouble, and most of the driveways to the front warehouse should work fine (there aren't any real driveways to the back, since you couldn't drive out from there anyways. The garage doors work fine though). As far as the various crashed cars and abandoned appliances scattered throughout the streets go, most of theses shouldn't be reachable, so hopefully your Sims won't autonomously try to interact with them. If they do, it should just give you a routing issue, so be a nice Divine Power and point them in the right direction, won't you? If you want to try to restore a car, the one INSIDE the front warehouse is fully interactable, as far as I can tell. 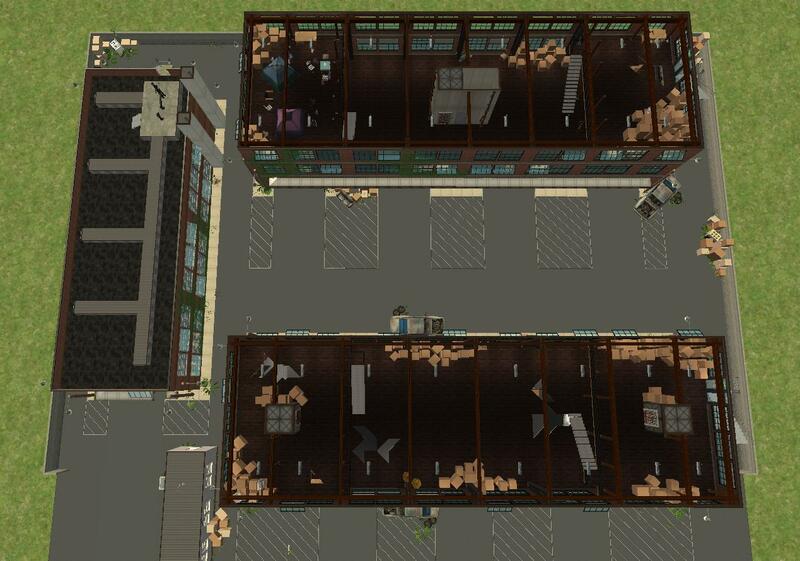 I also made sure that there are stairways providing access to all floors and the roof of each warehouse, so if your gameplay style requires that the power be down (if you're playing an apocalypse scenario, for instance), your Sims will still be able to get everywhere in any of the buildings here. 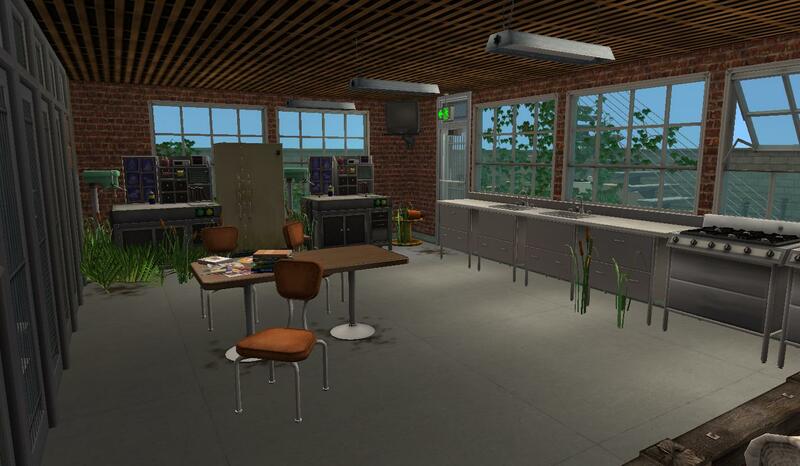 Since I'M the one who made it , it should surprise no one that even this lot, which provides virtually nothing in the way of creature comforts or modern living for your Sims, still rings in at more than $400,000. 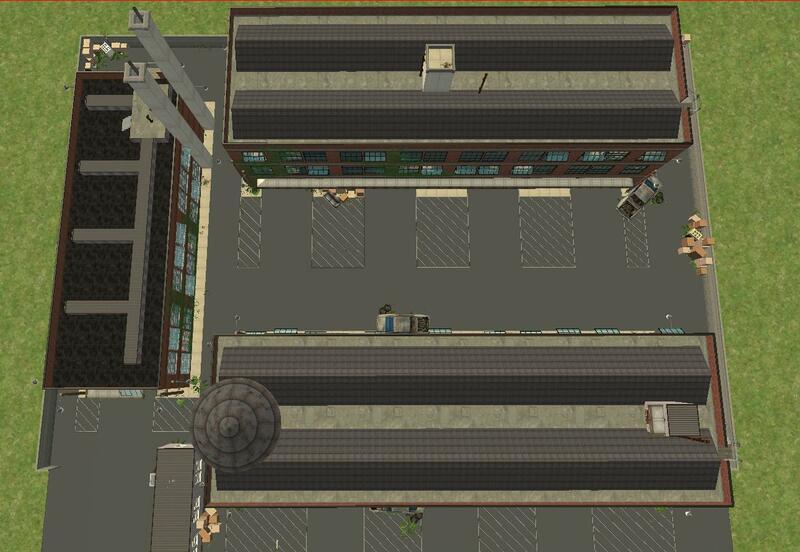 While this lot is definitely big (there's really no way to make a convincing warehouse on a small lot), it's actually surprisingly fast, since so much of it is just empty space. I won't say that it won't lag on a slower processor, I'll just say give it a try unless you're absolutely-100%-convinced that it couldn't possibly work on your machine. As per usual, there's no CC whatsoever on this lot (or any of my lots), so you won't have to track anything else down to be able to use it. I've also done pretty thorough testing on a clone of the lot, so I can vouch for the things that SHOULD work actually working, and at the same time guarantee that you won't have any problems with the lingering presence of my tester Sims. Finally, as far as EPs and SPs go, obviously you'll need every EP- SPs on the other hand, I'm less sure of. There's actually quite a few SPs that might not have been used, but it's been so long since I bought any of them that I can't really remember what came with what... I'll trust you to decide whether you really need something for yourself. As always, let me know if you run into any major problems, and I'll try to fix them as best I can! Enjoy! 320 people have said thanks to Zarathustra for this download.